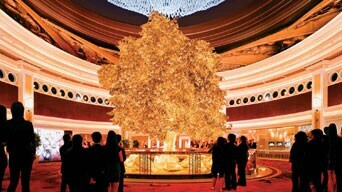 The iconic golden Tree of Prosperity - featuring over 2,000 branches and 98,000 leaves comprising 24-karat gold leaf and brass leaf - is a stunning symbol of auspiciousness. 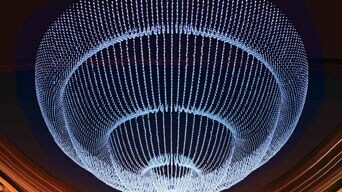 Designed to thrill and excite guests as they enter the Rotunda Atrium of Wynn, the Tree of Prosperity performance is a choreographic masterpiece of sculptural patterns, music, video and light. The centrepiece, which fills the atrium, depicts Chinese and Western astrological symbols rising from the floor in a climactic finale that transforms the tree into the vibrant colours of the four seasons.